Welcome to Visible Monday #162. If you want to participate, it’s so easy: just go to the bottom of this post for the how-to. Please be kind and leave a link to Not Dead Yet Style in your post. I am loving this lightweight wool skirt (similar) I picked up at a Catholic thrift around the corner in the West Village. It’s got zippers, and pleats and pinstripes. It’s very well made, by a designer I’d never heard of and who are now defunct: Marithe et Francois Girbaud. Very French, eh? The “Little Dog” sweater (sim) repeats the Paris-in-New York theme. It too was thrifted locally for about $10 and it feels soft and lovely to wear. The Aldo boots (sim) are old, thrifted, and super walk-able. It’s not hard to find fabulous thrift scores in the big city! You should see what I had to leave behind. What an amazing skirt 🙂 love this look..
Now THAT is a great skirt. You look fab Patti! Thanks for sharing the look on the black & white linkup. Flying low and coming in late as always … thanks Patti, for holding the door! You gotta’ know I’m dying for every piece of this outfit. Bet it feels good to get to wear fall clothes in a fall climate, or at least fall-ish climate! You look every gorgeous inch the NYC woman! Love this! The height of the boots, the asymmetry of the skirt, and of course anything with a dog on it is a hit in my book. Love this combo together, cute graphic sweatshirt. You look young and irreverent and one can see that you’re having a great time on those cloths. Very New York! Adorrre the skirt, and the boots look scrumptious. Great post Patti!! You are so chic! Patti, I love this skirt. It’s edgy but classy all at once. The way you paired it with rockin’ awesome boots and a little doggy sweater is a mix of rocker and cute. Love it! Thanks for coming to link up to my Style Story. Now it’s my turn with Visible Monday! Hi Patti – so sorry we missed each other in New York. This is a skirt I would have snatched up too – I love the shape. I found a few reasonable priced amazing things there too, all secondhand. One of my favourite outfits! Chic AND cute without being twee. I love the wool skirt and how you have reunited these two French pieces. Restraint must be tough in NYC but I can see how you couldn’t leave the skirt behind. I love this outfit! The skirt is very designerly looking and the doggie top adds an element of fun. Thanks so much for hosting, hope to see you at #iwillwearwhatilike! Patti You look lovely! Love your hair and red lip. I SO need to find a doggy top or sweater with a shih tzu on it, so hard to find . Love this one, just so cool with the black and white outline The skirt I love with the zipper and looks made quite well too, You got some great finds! Your skirt is so cute. Love the design! Lovely look, Patti! Your sweater is just too, too cute! Oh Patti! I love this entire look! The top is adorable. The skirt is so unique and interesting. The boots are completely fabulous! Well done! Thanks for hosting the link up and giving us a chance to be visible! You know I’m all about pre-loved, classic pieces so I’m just smitten with your outfit! The skirt is practically a work of art and the whole vibe is very NYC meets Paris. Patti! You are too cool already. This retirement thing has really cut you loose, girl. That skirt is beyond awesome. This must be one of my favourite looks on you, Patti. What a fantastic skirt and so right to pair it with that ever so cute t-shirt and those boots. Wow, what amazing thrifted finds they all are. I have thrift envy now! What a cool skirt! Love the all black look. What an interesting skirt, dear Patti. Thank you soooooooooooooo much for your link up party. Hi Patti, I just love that skirt! If you ever get bored of it perhaps you could post it on to me. Thanks for your link up and for helping me find lots of like minded ladies. My monochrome look today is homage to one you did recently. I love all special details in your outfit today. I super adore the boots. They are on this winter’s list. I do find that the thrifting pieces I have add personality to my style. Thanks for hosting us again. I remember Marthe et Francois Girbaud. I lusted after a very expensive pair of jeans that they made but that I could never ever afford. So see? You got yourself a gem. Love the tee. Tres beau. What a great find! This skirt is so fun with the zippers! Je l’adore! Especially the sweat shirt : ) But I bet you knew I’d write that. I would have fought you over that one. I think Sylvia is going to be some crazy jealous over that skirt. Love this edgy look on you! Thanks for hosting as always! Oh, Patti, I absolutely adore that skirt. That is an item I would be wearing weekly, if not daily. Love this entire outfit today! 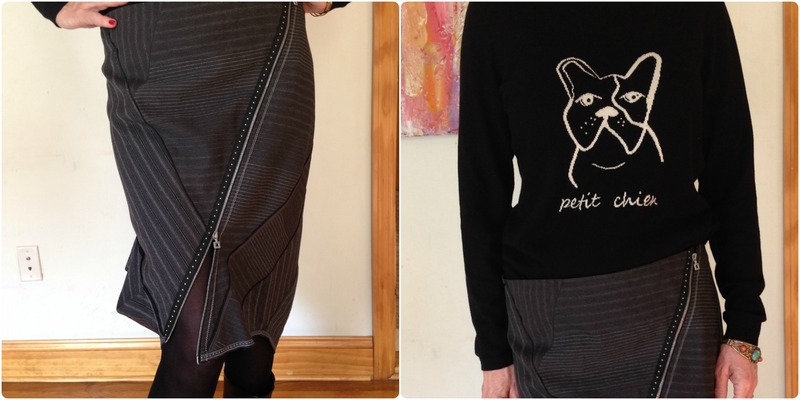 Your skirt is funky, edgy and beautiful and the cat novelty sweater is beautiful. Lovely Miss Patti. So jealous of all your trips to NYC…I really miss it. Thanks for the link up, Patti! Fabulous skirt! I love asymmetric and sculptural clothes. Looks like NY is definitely agreeing with you. Your idea of retiring to a place with more culture is something we’ve been talking about here, too. When we can downsize to a tiny apartment, maybe we can live in a beautiful city! I remember that fashion brand from the 80s, I was studying fashion back then… How unusual to see you in black! But you look fantastic, the skirt is quite spectacular. I remember Girbaud. They were worshipped by my milieu at fashion school in the 80s. Can it be zipped various ways to change the silhouette? Awesome, I love it Patti :). Thanks for the fun party! Wow, I love that awesome skirt, Patti! So chic and unusual! Thanks as always for hosting! I’ll be there in my Unsafe Ocelot soon!